PHOENIX -- When the next-generation Infiniti QX50 crossover arrives next year as a 2019 model, it will be powered by a 2.0-litre turbocharged four-cylinder engine introducing a technology never seen before in a regular production vehicle: variable compression. Shinichi Kiga, Nissan's chief powertrain engineer, says Infiniti's VC-T engine is expected to deliver a combined city-highway EPA-rated fuel economy gain of 27 percent over the QX50s's outgoing 3.7-litre V-6. The VC-T engine is rated at 268 hp and 288 pound-feet of torque. Kiga says the 2019 QX50 will reach 60 mph (96 km/h) almost one second faster than its four-cylinder competitors. Infiniti last week allowed a few reporters to drive early pilot-build 2019 QX50s at the company's test trackhere. The VC-T's power and refinement were impressive. The technology works in such a manner to make it invisible to the driver. There are no buttons to press, no switches to turn and no strange noises, vibrations or sounds -- just smooth, abundant power and a pleasing, performance-tinged growl from under the hood. The pistons in all of today's automotive internal combustion engines travel the same distance up and down in the cylinder, regardless of speed and vehicle load. The pistons are connected to rods that are mounted to the crankshaft. The engine's compression ratio is fixed and is determined by the amount of space above the pistons when they are at the top of their travel. The smaller the space above the pistons, the higher the compression ratio and the greater the engine's power output. The other end of the multilink has a short rod that is connected to a shaft. An electrically controlled actuator twists the shaft, causing the multilink to tilt up or down slightly. When the end of the multilink closest to the piston is tilted up, the piston travels to the top of the cylinder. That is high-compression mode, 14.1. When the multilink tilts down, the piston's travel in the cylinder stops before it reaches the top. This lowers the compression ratio to 8.1, but because the turbocharger kicks in at the same time, the engine's power output increases. The turbocharger pressurizes each cylinder with a denser mixture of fuel and air, which increases power. "Variable compression solves the age-old problem of compromise," says analyst Dave Sullivan of AutoPacific, a consulting firm. "Automakers have the task of meeting increasing emissions regulations and tightening fuel economy standards while consumers want more power. They have to dial down the compression to make everyone happy. "Nissan's variable compression engine should appease the enthusiasts as well as those concerned with fuel economy." 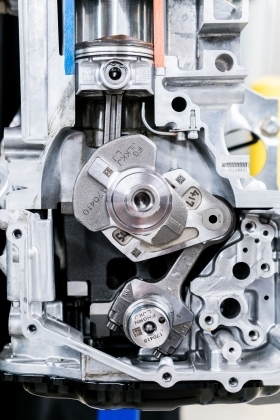 Kiga said Nissan has long known that its multilink mechanical system of varying piston travel would not just work but also be robust enough for a production engine. The reason for the 20-year gestation is that engine-control technology was not yet advanced enough to manage the complex system. "Control technologies helped us accelerate the development," Kiga said. The engine uses nearly all the advanced technologies found in today's production engines. In addition to the turbocharger, the VC-T has both port and direct fuel injection, variable valve timing and a cooling system with four circuits. All of these systems provide inputs to the engine's computer, which runs a fast-spinning electric motor that operates the actuator arm that changes the piston travel. The VC-T adds cost but is less expensive than a diesel engine. The VC-T engine, Kiga says, is about 10 percent more expensive to produce than a regular 2.0-litre turbo four-cylinder engine. And although the VC-T has more moving parts than other turbocharged, four-cylinder engines, Kiga says it produces less friction. One reason is because the piston travels straight up and down in the cylinder, eliminating side forces that cause friction. The current QX50, with its 3.7-litre V-6 engine, has a EPA fuel economy rating of 17 mpg city, 24 highway and 20 combined. When the new QX50 goes on sale, the combined fuel economy should be around 26 mpg, about what a diesel-powered vehicle of the same size would achieve, but without a lot of the emissions-system complexity. The VC-T engine will be the only one offered in the QX50, and it will be available with just one transmission, a continuously variable automatic. 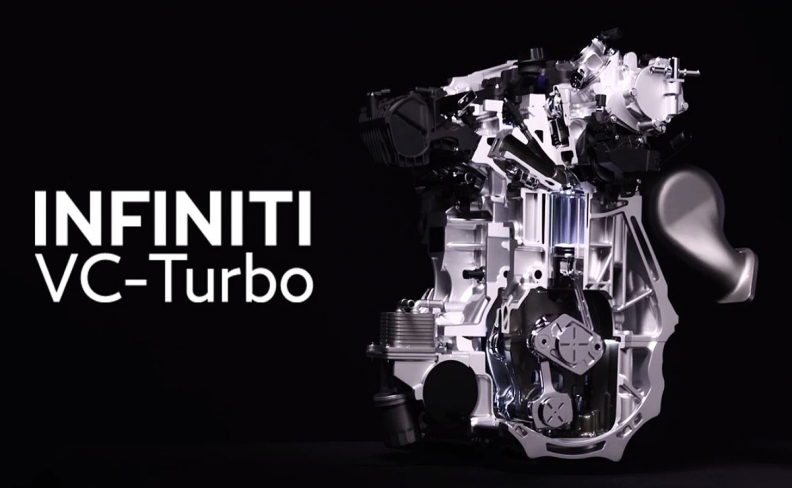 Although the Infiniti VC-T engine appears to be a significant advancement of the internal combustion engine, it may not have a huge impact, as governments around the world crack down on internal combustion engines and as automakers gear up to sell electrified vehicles. "The 2.0-litre turbo has essentially replaced the 3.5-litre V-6. It's a very crowded space in which to set yourself apart," said Sullivan. "Combined with the continually variable transmission, the VC-T engine could yield some impressive fuel economy numbers. But with the relative stability of low fuel prices, it may not mean much to QX50 buyers. The immediate impact may not be felt with the QX50. But this technology only gives the internal combustion engine longer legs." While the VC-T's performance and refinement in the test QX50s were outstanding, perhaps a downside for potential buyers is that the engine requires premium gasoline.